Growing leafy greens throughout the hot steamy days of summer is a breeze if you select the specific leafy greens that can stand the heat and continue growing without bolting. Sure, most greens are more comfortable during the cool days of early spring or fall, but there are many varieties that are comfortable growing during hotter times. Here is a list of leafy summer greens that great for growing during the warmer seasons and they will keep producing nutritious leaves that can be harvested on a daily basis. Collards – One of the hardiest of all greens, collards can grow through the summer just as easily as it survives cold winter conditions out in the garden. Kale – Not quite as tolerant as collard greens, kale is capable of providing summer greens from the garden. Tuscan Black Palm Kale is an especially good variety for summer production. Mustard – Not everyone’s favorite because of its spicy flavor, mustard greens will grow well during summer. Try Red Giant and pick the leaves young to add color and some kick to salads. Amaranth – These plants are very ornamental and will grow over five feet tall. In addition to the edible leaves the plant also produces a seed cluster that can be used as a grain. 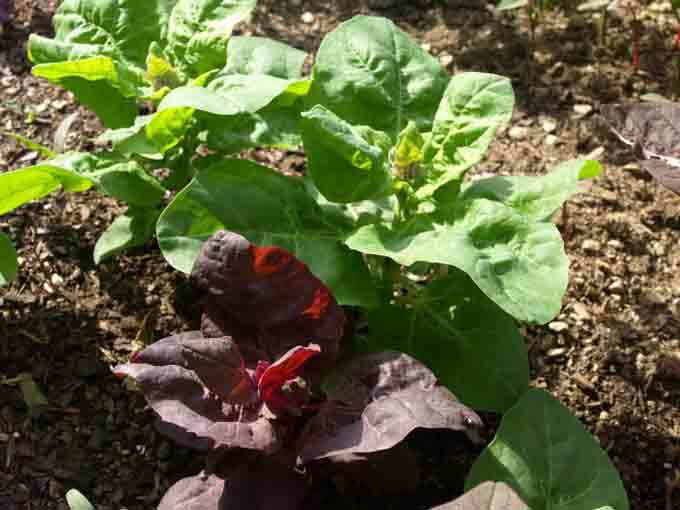 Orach – Another attractive leafy green that is seldom seen in the vegetable garden. This beautiful plant is offered in a number of strains and is usually reddish or green in color. Lambs Quarters – This one is an “edible weed” that tastes better than many of the greens cultivated in the garden. You may be trashing this wild plant without realizing it is edible. Dandelion – Another edible weed with cultivated strains and close relatives that can all be grown for food. Dandelions won’t struggle a bit under the summer’s growing conditions. Malabar Spinach – This unusual leafy vegetable even thrives in the tropics and once established it can be cut to the ground and it will resprout and continue to grow. Swiss Chard – Take care of those despicable leaf miners and your Swiss Chard will have no trouble at all in withstanding all that the summer season can throw at it. Beet Greens – Don’t overlook vegetables like red beets that are typically grown for their roots or fruits, but also produce leaves that make excellent greens! That’s just a partial list of heat tolerant summer greens and I could continue on, but that’s enough to give you a feel for the options available to raise greens during even the hottest days of of the year. This post is very timely, as I’ve been lamenting about the lack of leafy greens in the summer. All my lettuce, spinach, and arugula bolted, and I’ve been wondering if there were any leafy greens that could survive the heat. Your post (and the rest of your website) is very helpful to first time gardeners like me. Thank you so much! Yes I understand the list of greens that are heat resistant, but can these seeds be set and will they come up in the heat? I have dreamed of constructing a clothe line over my leafy greens bed, with the intention of hanging my still damp clothes over the greens, during the hotest time of day. The clothes line would serve two purposes, first I love clothes that are line dried, they smell great and whites seem to be whiter second I would imagine that the plants could benafit from the moisture and the timely shade. I can’t be the first person who has thought about this…any thought on this? Victoria, all of these greens should germinate just fine in spite of the heat. I’m considering suspending some shade cloth over a bed of leafy greens this summer but I don’t know that your clothes drying on the line will provide enough moisture or shade to make much of a difference to the plants. Great timing on this post, I wonder if you have any more information from experience about which of these can be planted this late in the year and still give a quick harvest? I know beet greens should be quick – 2-4 weeks depending on the weather (at least, in my garden). I have no idea about the others – except that I’m reading the kale is best after a few frosts, so maybe not so good as a midsummer food? My red malabar is several weeks old and only has 4 leaves, so it doesn’t look like I’ll be harvesting that any time soon – I’m starting to wonder if I’ll get to taste it at all this year! How long does it take orach and mustard greens to grow to a harvestable size? I’ll pick up some seed packets and find out, I guess – got some bare spots where the radishes, lettuce, and peas used to be (the peas would still be going except between the birds and the bunnies they were eaten to the ground too many times in a row. Better planning next year.). One we’ve had excellent luck with in various weather conditions during several odd years is spinach mustard. I thought it was common since I had a huge bag of seeds from 2006 that I’m still using, but finding new ones has been a challenge. The old ones are still sprouting beautifully, but they’ll run out some day (and we eat the greens before they can make seeds, they’re SO good). The greens are large but smaller than collards, pretty smooth, and with a lovely mild flavor, not really like spinach or mustard. I plan to plant every 2 weeks until into the fall this year, that and kale are my favorites! Meghan, the beets are pretty fast growing but may be slower to germinate in the heat, probably best to start them in the spring to yield lots of greens during the summer. My malabar is growing embarrassingly slowly as well, hopefully they will pick up the pace soon. The flavor of kale is improved by frost and cooler temps but I like the taste even during warmer periods of the year. Mustard greens will be among the quickest performers right now, especially if you keep it well watered. Orach will take a bit longer to reach harvestable size. In the cases of all these summer greens the best approach is to plant and germinate the seed before the heat of summer arrives so that they have an opportunity to become established and put up a leaf canopy to shade the soil and conserve moisture once the worst of summer arrives. We gardeners need to always be thinking ahead: What will we have in place when the spring greens are finished? When I put garlic in, in the fall, my winter greens go in above them. Properly sheltered, they will see us through the winter, and well into spring. If the winter has killed the greens, then I replant where the garlic has been sleeping, as most lettuces will be done by the time the garlic needs to be harvested. I plant greens on the hills between the leeks, and as they mature, the hills fill in the trenches the leeks were planted in. This raises the ground above the leeks, and furrows appear where the hills ran. Then a thick mulch gets laid between the rows of leeks. In the heat of summer, few seeds will germinate. Seeds I planted late in June this season failed to grow; the few that did are thin and spindly. This tells me I need to adjust and plant earlier next year. The extreme heat has prevented the beans from setting pods and stopped the tomatoes from setting new fruit, regardless of being watered well. So your garden is a learning experience, every year is different. We learn by trying this and that, finding success and failure. Spring greens are gone, if your second planting failed, wait a few weeks until the heat of summer begins to wane and then plant for fall and winter. You can start your fall cole crops indoors, or in a sheltered and well supervised location outside now and have them ready to set out then. But always be thinking ahead. good luck, from a small space gardener! I love Swiss Chard and this is definitely my favorite to grow throughout the summer. We grew Fordhook for the first time this year and I will grow this variety every year. It is the best tasting by far. Good call on the leaf miners. What do you usually use to take care of them? Hi Alex, I usually don’t bother trying to do anything to control the leaf miners other than ensuring enough diversity in the garden to attract beneficial predatory insects. Some years the miners are bad and other years they are barely noticeable. I remove the damaged leaves and the problem always eases up as the summer progresses. Hi Kenny, your blog is looking really good these days! Your recent comment reminded me I should catchup a bit. I’m behind in reading almost everyone’s blog. We’ve just had a really hot dry spell here, and even my swiss chard is mostly all bolted. This post reminds me I should really be trying some of these other greens too. I hope your summer is going well. Hi Patrick, thank you! Yeah, I know all about falling behind with things. I’m trying to come up with a better system and start using a feed reader to stay on top of things better but I’ll see how that goes. Been dry here too but we’ve finally started receiving some much needed rainfall on a regular basis. Hope things improve for you too. Thanks for this info, I have just ordered some amaranth seed so will be looking forward to trying them out sometime. Would it be too late to plant here in south eastern PA? Last year we planted broccoli. We did not get much in the way of broccoli crowns, but we did some research and found you can eat the leaves. Our three bushes became our source of greens and served us well into late fall last year. No, it’s not too late to plant amaranth, it grows pretty quickly… you’ll get lots of leaf production and probably even mature seed plumes.